As we didn't get back last night until close to 5, it was a good day to sleep in. Early this afternoon, Jess (Chris' girlfriend), Chris, and myself went to a park alongside the Chesapeake Bay. It was huge with its own golf course - reminded me of Eisenhower Park in Long Island. This whole trip, although it has only lasted a few days, has been full of friends telling me about places I can stay when I'm out on the road. My friend Mary Lou from the Danielle House has sons in Dallas; Jess has a former roommate in San Francisco I can stay with. Looks like I may not have to do as much sleeping in the car as I originally thought. Everyone has been so supportive and helpful...I am blessed to have great friends. After the park we came back to Chris' and just hung out for most of the day. I fell asleep for a while, actually. I was very comfortable in his air-conditioned apartment. Later in the day we went to Wal-Mart as he had to buy groceries, and I needed more supplies for my trip. My water has gone incredibly fast, so I bought more bottles, bought some more granola bars, carrots, and some more raisins. My friends have made fun of what my diet will be like on this trip, but I figure this is about the best I can do to try and eat (relatively) healthy and have dry food I can bring with me when I go camping. As I forgot my bathing suit, I also purchased one at Wal-Mart so that I can swim at the Jon's in Texas. Chris made chicken cutlets for dinner which really hit the spot. He's been a great host and I'm grateful I had the chance to come down. Already tomorrow is the 4th...although I've allowed myself a whole month for this trip, I have a feeling it will go by fast...so tomorrow I'll begin heading in a westward direction, not to come back in an eastern direction probably until I'm in the state of Washington. I'm headed to Great Smoky Mountains National Park which lies on part of the border of Tennesee and North Carolina. I hope to be out there by early afternoon, and I imagine I'll probably pitch my tent that night, as well, for the first bit of camping this entire trip. I hope to have some good picture from there to share on this website. I left Philly early so to avoid all the traffic for the Live 8 concert. I didn't get a lot of sleep, but it was much more than I got on the night before I left JC. After taking the bus from the city to where my car was parked, I ended up leaving there around 9:30. 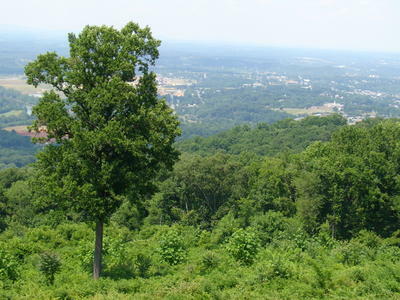 My next destination would be Shenandoah National Park in Northwest Virginia. The best route for me would be to take I95S to 66W, but unfortunately I95 runs through Baltimore and Washington D.C. I was hesitant because I didn't know what the 4th of July traffic would be like, but it was going to be the most direct route. I'm so glad I purchased satellite radio for my car before I headed out. Not only can I listen to the same programs without losing a connection (theoretically I can listen to the same program, real time, driving from JC to LA), but also it has stations solely dedicated to weather and traffic updates for major cities. So I just selected the "Baltimore" and "Washington" stations when I got in those areas, and it really helped, as I could take detours around the areas with heavy traffic. I ended up getting through those two cities fine, with only a slight delay in Baltimore. 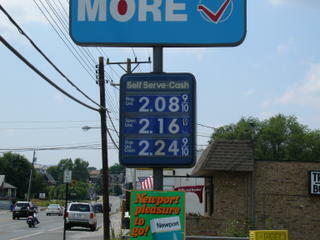 I arrived in Front Royal, VA hours later, and stopped for gas. Not too bad, right? Front Royal was just north of Shenandoah National Park. There is a highway that runs for 105 miles through the park, Skyline Drive. I figured I would drive most of Skyline, make a few stops along the way, and then I'd head onto the next stop. Despite a slight haze from the humidity, it was a beautiful park, especially so at the higher elevations. 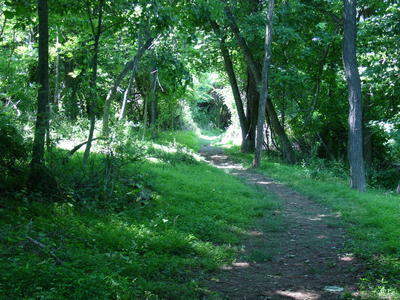 I got out early in the drive to walk a trail - Fox Hollow Trail, specifically. Apparently, most of the visitors to the park only drive through part of Skyline Drive, only to get out of their car at the overlooks to take pictures. I thought it would be worthwhile to see just a bit of the woods...it was interesting how quiet it gets as soon as you got away from the highway. All you could hear in the woods were the birds and the wind in the trees. Quite a change, especially because I wasn't even a mile from the highway. It was cool in the forest - the humidity wasn't noticeable at all. I drove through about 75% of the park, then figured it would be time to head onwards to Virginia Beach, in SE Virginia, to see my friend Chris. 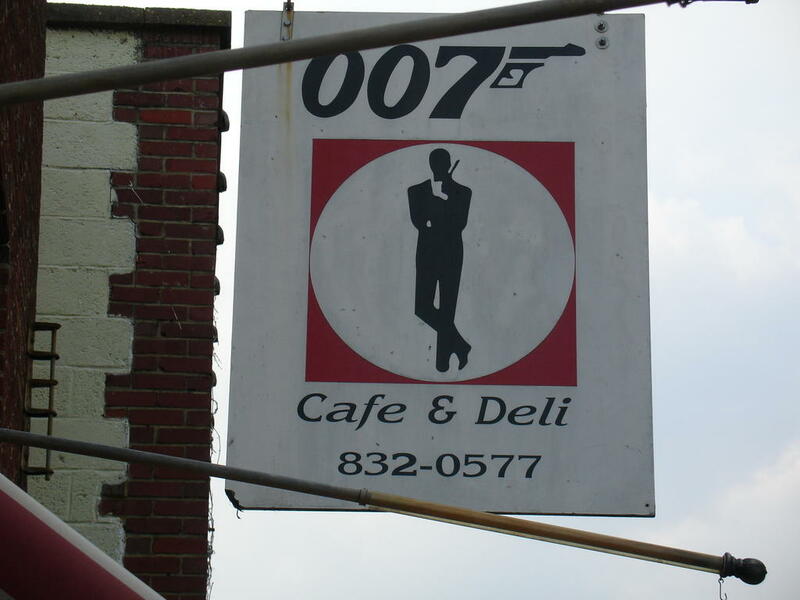 On the way there, I stopped to have a sandwich at this little cafe in Gordonsville - The 007 Cafe. It was a nice little place, with old Bond movie posters adorning the walls. 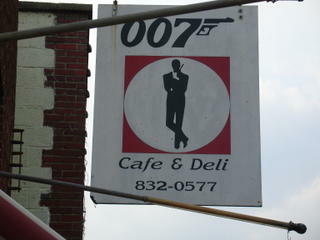 I figured I couldn't go there and not take a picture for my father, the James Bond lover. 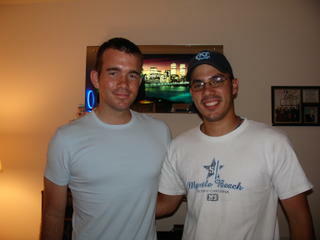 I continued on towards Virginia Beach, passed through Richmond, and arrived in Portsmouth to see my friend Chris. I used to play CYO basketball with Chris, and he's down here now working as a landscaper. He showed me the downtown VA Beach area, which is a very nice area with fancy restaurants and bars, nothing like State Street back home. It was surprising how much energy I had after driving 500 miles during the day - it goes by quick when you don't have to hunt for radio stations or go through CDs, that's for sure. Again, satellite radio = great investment. Chris is putting me up for as long as I would like to stay...I imagine I'll head out of here early on the 4th towards western NC to spend some time at Smoky Mountain National Park. Looking at the map, I didn't realize how close (relatively) that is to Huntsville, AL where my Aunt Paula lives, so I probably will be down her way on the 5th or 6th. Happy 4th, everyone. Enjoy the holiday.